The "Bricha" movement operated in Europe from the end of World War II until the establishment of the State of Israel, and was responsible for the smuggling of some three hundred thousand Holocaust survivors from Eastern Europe to the southwest - to the ports of the Mediterranean, survivors who chose to abandon the killing valley of Europe in order to establish a home for themselves in the Land of Israel. The roots of the "Bricha" were a spontaneous organization of Holocaust survivors who came out of camps, forests, and hiding places and began organizing for mutual assistance. They were orphans, bereaved, last descendant of their families. The first to organize were Jewish partisans and graduates of the Zionist youth movements. They were organized in "kibbutzim" - where the refugees got a blanket, a pair of pants, food and shelter - a kind of family and first address. The survivors then met with the soldiers of the Jewish Brigade of the British Army, who exploited their status and the means at their disposal for the benefit of their fellow survivors. Many of the soldiers remained in Europe after being released from the "Brigade" in order to continue their activities. Later on, the "Mosad for Aliyah Bet" of the Haganah, which was established to help Jews immigrate to Palestine despite the ban imposed by the British Mandate authorities, undertook the management of the escape. 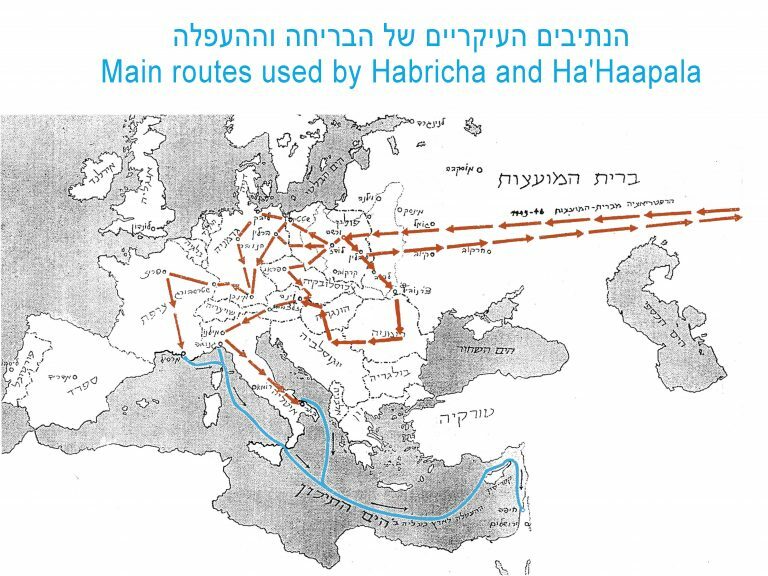 The Palestine emissaries of the Mossad set up a network of lanes and transit camps across Europe. With their assistance and leadership, the Bricha movement became one of the most important elements in the immigration to Palestine and in the struggle for the establishment of the State of Israel. In Poland after the war there was political unrest and the Jews who remained there or returned to it suffered from alienation and anti-Semitism. In 1946, Polish rioters in the town of Kielce staged a pogrom against Jewish survivors. This massacre has become a turning point. There was no longer any need to urge the persecuted Jews to leave Poland. The ongoing anti-Semitism and the longing for a warm and secure home in their own homeland forced tens of thousands to join the Zionist organizations. A mass influx of Jews from Poland through Romania, Czechoslovakia, Ukraine and Hungary to the DP camps in Germany, Austria and Italy, controlled by the Allies began. From there they continued to the ports of Italy and southern France en route to Eretz Israel. The "Irgun Ha - Bricha" dealt with the logistics involved in this movement: transportation from city to city and from country to country, crossing border crossings with bribes and forged documents in the organization 's labs, crossing borders on foot and snow, organizing transit camps and taking care of those on their way to seaports. Among the immigrants were thousands of orphaned Jewish children who were rounded up, rescued or rescued by the "Irgun Ha - Bricha" from convents, Christian families, caves and hideouts throughout Europe. These children needed care, care, education, and love that had been denied them during the war years. On their way to Eretz Israel, some of the survivors lived in DP camps in the territories held by the Allies in Germany, Austria, and Italy. In these camps the Bericha conducted extensive support and rehabilitation activities with the assistance of American Jewish organizations, especially the Joint, whose contribution was invaluable. 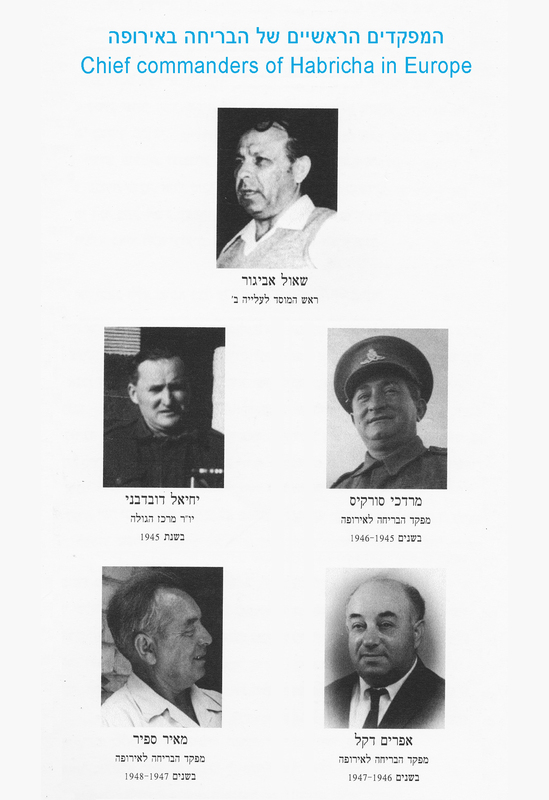 Members of the Yishuv in Palestine who served in the "Jewish Brigade" and in the Transport Battalion, and were active in the struggle against the Nazis within the framework of the British army, contributed greatly to the Bricha. They provided military vehicles for the transportation of the refugees, assisted in the treatment of the camp residents, and carried out vocational training programs for their rehabilitation. At the end of the war, many of the soldiers chose to remain in Europe for a long time and continue their contribution to the national mission. As time went by it became clear that the Bericha had gone beyond its original form, and together with the Haapala movement played an important political role in the struggle of the Jewish people for its independence. The tens of thousands of Holocaust survivors who moved in Europe without a home and without a future created an international problem that, in practice and morally, undermined the British "White Paper" policy, which limited the entry of Jews to the Land of Israel. The Anglo-American Committee (1946) and the UNSCOP Committee (1947) were established in order to solve the problem, and members of the committees visited the displaced persons camps in Germany and recommended that survivors of the Holocaust immigrate to Eretz Israel. The decision of the UN General Assembly on November 29, 1947, to establish a Jewish state in Palestine. The Bericha movement on the roads of the European continent and the Haapala movement on the routes of the Mediterranean Sea, both under the umbrella of the Mossad Le'Aliyah Bet, headed by Shaul Avigur, are the two parts that comprise the story of the rise of She'erith Hapleitah to Israel and constitute a glorious chapter in the history of modern Jewish history . It is a chapter of heroism, courage, initiative and trickery that was characterized by sacrifice and love of the people and the homeland, a chapter that took place between two dramatic events of hysteria, namely, the Holocaust and the establishment of the State of Israel.